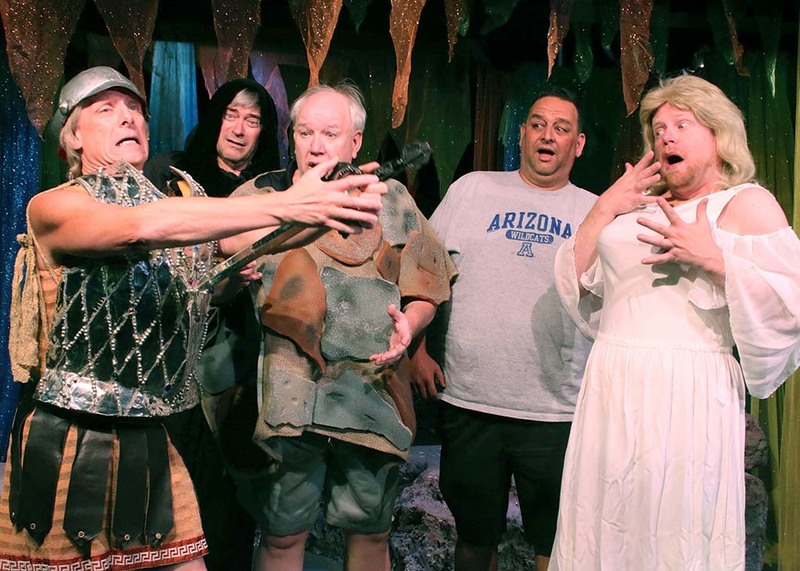 Copperstate Productions and Fountain Hills Theater are proud to announce the opening of Midsummer Dreamin’, a rollicking modern musical adaptation of Shakespeare’s “A Midsummer Night’s Dream”, adapted by Peter J. Hill. Shakespeare’s characters are set in the hippy-dippy America of the 1970’s, in the summer of love. When the characters sing tunes like The Lion Sleeps at Night, Y.M.C.A. and Aquarius, you know this ain’t your Grandpa’s classic! Mia is in love with Andy, but her father wants her to marry Denny. To escape the arranged marriage, she and Andy elope into the woods. Denny follows them and is pursued by Helen, who nurses an unrequited passion for him. A love quadrangle develops among the young lovers when mischievous Puck plays Cupid. Meanwhile a group of amateur actors rehearses a badly written play in the woods, and soon find their lives changed by the doings of Oberon and Titania, the warring king and queen of the fairies. Midsummer Dreamin’ is written, produced and directed by Peter J. Hill, choreographed by Noel Irick and musically directed by Jennifer Whiting. Midsummer Dreamin’ is being presented by Copperstate Productions in co-operation with Fountain Hills Theater. The show runs June 30 – July 30 (no performance on July 9th) with performances on Fridays & Saturdays at 7:30PM and Sundays at 2PM. Individual tickets are $30 for adults and $23 for Youth 17 and under. Group, senior and veteran discounts available. Fountain Hills Theater is located at 11445 N. Saguaro Blvd., Fountain Hills AZ 85268. Tickets are available through the Box Office at (480) 837-9661 ext. 3 or by visiting www.fhtaz.org. Box Office hours are Tuesday through Saturday 10AM to 5PM. *Please note change of time for evening performances to 7:30PM.